Jack is a second-year postgraduate MPP candidate from Deerfield, Illinois. He majored in Economics and Political Science during his undergraduate studies at La Salle University in Philadelphia. His primary policy interest in the Batten School is health care. Jack is a Fellow with When We All Vote and the Community Engagement Chair of the Batten Graduate Council. Outside of class, Jack enjoys running, reading, playing basketball, and supporting U.S. Soccer. Please feel free to contact Jack at jd5cj@virginia.edu. 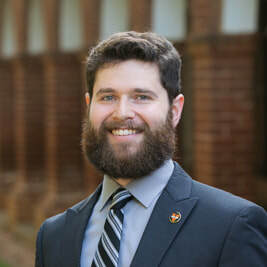 ​(jl4cn@virginia.edu) James is a second-year MPP student from Adamstown, Maryland. He earned his Bachelor's degree in Government & Politics and Philosophy from the University of Maryland, College Park. He is primarily interested in health policy and the intersection of policy and politics. Prior to enrolling in the University of Virginia, he worked on several state and federal political campaigns and worked for the American College of Radiation Oncology. 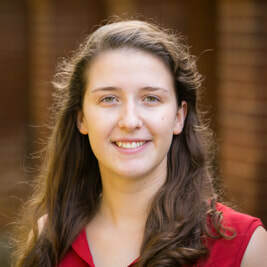 (ebb5vu@virginia.edu)​ Ellen is a second-year accelerated MPP student from Nashville, TN. She received a B.A. in Foreign Affairs and Persian Language and Literature from the University of Virginia. Ellen is especially interested in the topics of conflict theory, countering violent extremism, labor migration, and non-state actors as they relate to Iran, Afghanistan, and Central Asia and was sponsored by the U.S. Government for nine months of intensive language study in Tajikistan. (jm2hp@virginia.edu)​ Joshua is a second-year postgraduate MPP student from Edison, NJ. He received his B.A. in Psychology from Rutgers University in 2013; he minored in Public Health. This past summer he served as a Research & Policy Intern with the National Commission on Military, National, and Public Service where he researched the Selective Service System, among other things. Throughout the school year, Joshua will continue his work with the commission as they prepare their report for Congress and the President. Upon graduation, Joshua hopes to work in emergency operations for the federal government. (ah4kn@virginia.edu)​ Anna is a first-year MPP student from Troy, Michigan. She graduated from the University of Michigan in April 2018 with a B.A. in Biopsychology Cognition and Neuroscience and Modern Greek. She also worked as a managing editor for The Michigan Daily newspaper and the editorial assistant at the Alumnus Magazine. Her interests include journalism, political work, national security, and foreign service/policy. Alexandre is a second-year accelerated MPP student from Arlington, Virginia. He earned a Bachelor's Degree in Foreign Affairs and Economics. Alexandre is primarily interested in issues of governance and education as they relate to international development. During the summer of 2018, he interned for a education and workforce development nonprofit in Washington, DC. Anna is a second-year MPP from Richmond, Virginia. She is most interested in internet and media policy and recently interned at Next Century Cities, a membership organization of 190+ cities looking to improve broadband access for their citizens. Anna also serves as the Public Editor of The Cavalier Daily, U.Va. 's independent student newspaper. Anna holds bachelor's degrees in Media Studies and Spanish from the University of Virginia. Shea is a second-year MPP student from Fairfax, Virginia. He earned his B.A. in Foreign Affairs from the University of Virginia in May 2017. His policy interests are primarily centered around foreign policy and national security issues. Shea’s most recent summer internship was for a national security related federal consulting firm in Tyson's Corner, Virginia. He also has spent time on UVA’s Student Council with the Appropriations Committee and volunteered with Batten’s National Security Policy Center. Hannah is a first year MPP-MPH dual degree student from Huntingtown, Maryland. She received her B.S. in Public Health Education from James Madison University in nearby Harrisonburg, Virginia. She is primarily interested in health policy, with a secondary interest in nonprofit management and advocacy work. Before matriculation to UVA, Hannah worked at a local nonprofit in Staunton, Virginia, where she ran the fundraising and engagement efforts to support a child abuse advocacy program. IN her free time, Hannah runs a wedding photography business, and loves spending time outdoors with her energetic husky pup. Kevin is a first-year joint degree student from Chesapeake, Virginia, pursuing an MPP and JD. He graduated from Virginia Commonwealth University in 2018 with a BA in Political Science and minors in environmental studies and music. His areas of interest are environmental policy and law. Ashley is a first-year postgraduate MPP student from Winston-Salem, NC. She received her B.S. in Business with a minor in Mathematics at Anderson University in South Carolina in 2018. She developed an interest in policy during her undergraduate, where she advocated for refugees resettling in South Carolina, served as the president of her campus diversity club, and interned for a summer at Wake Forest Baptist Medical Center. She is most intrigued to study domestic policy issues that impact communities in poverty. Henry is a first-year postgraduate MPP student from Lincoln, Massachusetts. He is also pursuing an MBA from the Darden School of Business at UVA. Henry received his B.A. in Government and Philosophy from Dartmouth College in June 2015, where he focused on international relations and nuclear security. Prior to returning to school, Henry worked for an investment management firm in Boston and an aerospace and defense consulting firm in Washington, DC. His main policy focuses include energy, economic policy, and foreign policy. LeAnn is a first-year postgraduate MPP student from El Paso, Texas. She graduated from The University of Texas at Dallas in 2013 with a B.S. in Public Affairs. Since graduating, she has worked as The State of Oklahoma’s Workforce Planning Analyst and in the private sector in human resource data analytics. Upon graduation from Batten, she would like to work in the nonprofit sector focusing on health policy. Rebecca is a first-year MPP student from Annapolis, Maryland. She earned her B.A. in Environmental Thought & Practice from the University of Virginia in May 2018. Her primary areas of interest include energy and environmental policy and law, with a secondary interest in trade policy. Prior to enrolling in Batten, Rebecca interned for the Administrative Judge of Maryland’s 5th Judicial Circuit and, more recently, for the Policy Resolution Group at Bracewell LLP in Washington, DC. Abby is a first-year accelerated MPP student from Richmond, Virginia. She is currently finishing her bachelor's degree in American Studies with a concentration in race & ethnicity. Her areas of interest include education policy, criminal justice policy, and broader issues of race, socioeconomic status, and equity in domestic policy. Outside of VPR, she mentors high school students in Charlottesville through the organization Young Life. She has also volunteered with the St. Bernard Project, a nonprofit in New Orleans dedicated to housing reconstruction and recovery efforts from Hurricane Katrina. Upon graduation from the Frank Batten School, she hopes to work for the U.S. Department of Education or in the nonprofit sector. Tatenda is a first-year MPP student. Before her Master's studies, she worked at the American Enterprise Institute (AEI), a leading public-policy research think-tank located in Washington, DC. Tatenda joined AEI in 2014 after completing her undergraduate studies in Mathematics & Economics at Ave Maria University in Florida. At AEI, she initially worked as an economic policy research intern then joined the academic outreach team where she managed undergraduate and faculty educational programs. Tatenda was born and raised in Zimbabwe, which drives her interests in global development policy & entrepreneurship. Brendan is a first-year accelerated MPP student from Arlington, VA. He will graduate from the University of Virginia in 2019 with a B.A. in Economics. He has wide policy interests that include education, healthcare, and development. In the summer of 2018, he interned at New American Economy, a think tank that makes the bipartisan case for comprehensive immigration reform. 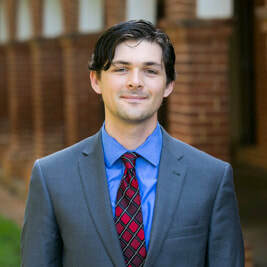 James graduated with a double major in Psychology and Spanish from the University of Virginia in 2012, and then worked as a research coordinator at the Institute of Law, Psychiatry, and Public Policy for five years. During this time, he developed an interest in pursuing a career involving public service, and decided to continue his studies at the Frank Batten School of Leadership and Public Policy with the MPP class of 2020. Originally from Winchester, Virginia, Madison is a first-year accelerated MPP candidate and third-year in the College if Arts and Sciences majoring in Foreign Affairs. Her interests in foreign policy, immigration policy, and international diplomacy began after interning for a member of the US House of Representatives, at UVA's Center for Politics with Professor Larry Sabato, and in the House of Commons of the Palace of Westminster in London, England. This past summer, she studied comparative politics at the London School of Economics as a fellow of the Hansard Society, a prominent non-partisan think tank in the United Kingdom. Outside of VPR, she serves as the Debate and Oratory Committee Chairman for the Jefferson Literary and Debating Society on Grounds, as an Ambassador for the Harvard Kennedy School's National Campaign for Civic Engagement, and is a member of UVA Student Council. Winston is from Richmond, VA, and is majoring in Foreign Affairs. His areas of interest include healthcare, prescription drug pricing, and the opioid crisis. Winston has worked with two pharmaceutical companies involved in combating the opioid crisis through harm-reduction and overdose reversal strategies. Upon graduation from the Frank Batten School, Winston hopes to continue on to law school, where he hopes to specialize in pharmaceutical law. This past summer, Winston researched the ways in which free and charitable health clinics in Virginia are changing in light of Medicare expansion. Winston is also an avid traveler, and skier.